When the suicide rate among U.S. Army personnel began rising in 2002, reaching record levels in 2007, 2008, and 2009, the Army took action by commissioning a large-scale study to try to understand why this was happening and what could be done about it. The Army Study to Assess Risk and Resilience in Servicemembers (Army STARRS) was launched in 2009 to shed light on what puts soldiers at risk of suicide. Not surprisingly attempted suicide has increased along with the rate of increase in suicide and is an important indicator of suicide risk. The study’s lead author Robert Ursano and SRC researcher Steve Heeringa, one of the principal investigators of Army STARRS, and others recently published findings in the Journal of the American Medical Association Psychiatry on sociodemographic, service-related, and mental health risks for suicide attempt among soldiers who were on active duty between 2004 and 2009. They compared Regular Army-enlisted soldiers who were currently deployed, previously deployed, or never deployed. Soldiers who had never deployed had the highest rate of suicide attempt, followed by previously deployed and currently deployed soldiers. Female soldiers were more likely than male soldiers to attempt suicide. Soldiers with fewer years of service were at greater risk compared to those with longer years of service. Not surprisingly, a recent mental health diagnosis-especially posttraumatic stress disorder, substance abuse, and depression-put soldiers at increased risk of suicide attempt. They also explored the method and timing of suicide attempt. Those who were previously or currently deployed were most likely to attempt suicide with a firearm. The timing of when soldiers were at greatest risk of suicide attempt differed by deployment status. For those who were never deployed, risk was greatest early on, in the second month of active duty. This period is known to be a stressful period during basic training and Army acculturation. More research is needed to determine whether this is a pattern arising from expanded Army recruitment during war. Ursano, RJ, et al. (2016). 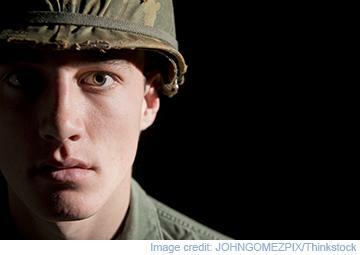 Risk Factors, Methods, and Timing of Suicide Attempts Among US Army Soldiers. JAMA Psychiatry, 73(7): 741-749.